High Resolution PDF’s, High resolution JPEG’s, Illustrator, Photoshop or Indesign files. If you wish to submit artwork created using a program not listed above we may be able to accommodate you but please contact us to discuss this first. We prefer all artwork to be supplied as high-resolution PDF. However no matter how you supply your artwork it is important that all the below criteria is met. We require a minimum of 300dpi. You can send the file set to a higher resolution if you prefer, however all this will do is increase the file size, and make the uploading process slower. Scanned colour and greyscale images should be 300dpi at the final size in the document submitted. Bleed is the area of your artwork that will be cut off during the trimming process and anything in this area will be removed. Therefore when sending files to print we require your artwork to include 3mm bleed on each side of the document – 6mm to each measurement. i.e. for A4 without a bleed is 210mm x 297mm, with a bleed is 216mm x 303mm. Also any images or block colour that you wish to be printed to the edge of the finished page needs to be extended into this bleed area. Even if this colour is white, we still require a bleed! Not having a bleed edge on a file is the main cause for delays in printing. When designing supplying artwork, please ensure that you supply it at the final document size (plus bleed). i.e an A5 file should be provided as A5 artwork, not as an A4 document for us to then scale down. All our products are printed full colour. Therefore your document will be printed using a four-colour process – CMYK. It is important you design your documents in CMYK. Although we can accept files with RGB colour, once we receive them we will automatically convert them to CMYK and there may be a colour difference on conversion. We cannot be held responsible for your final print not looking the colours intended, and this is why we insist on you supply directly in CMYK. If you are using big areas of black in your artwork eg. a black background – we recommend setting your black as C 75%, M 68%, Y 67%, K 90% instead of just K100%. On screen this colour will look slightly blue but in print will appear black. Embedding fonts into your original design will stop them changing or appearing differently after they have been printed. If you are unable to embed your fonts please supply all the fonts used in each document. Although we have an extensive range of fonts, there is no guarantee that the versions you have used will match the versions we hold on file. The minimum text size on all artwork should be decided depending on the design and finished artwork size. Text smaller than 7pt should not be positioned on a white background and text smaller than 9pt should not be positioned on a coloured background. Also bear in mind, text that is 7pt on an A4 poster will only be noticeable when viewed closely and on anything larger is unlikely to be seen. We also recommend that you place a Safe Zone on all files of at least 4mm from the edge of the document. This is to ensure that all important text and images are not at risk of being cut off in the trimming process. To get the best results we recommend submitting your files as a PDF. Saving as a PDF will preserve the text as layers, which will result in a higher quality finish than if you flatten the PDF. Preview how your print will be appear when it is printed, by selecting Overprint Preview. This should identify any vector objects that have Overprint applied to them – the object would appear transparent and this is how your artwork will be printed. Matt - Matt coated paper has a low surface sheen and luxurious feel. It offers excellent ink to paper contrast, and printed colours appear bright and defined. The overall look is more low-key than gloss coated paper. Gloss - Gloss coated paper has a high surface shine and very smooth finish. Printed colours ‘pop up’ and appear extra vibrant, making it a favourite choice for promotional items. Uncoated - Our uncoated paper has a soft finish and tactile quality. Because it’s more absorbent than coated paper, printed inks appear flatter. It’s the best choice for stationery as it’s easy to write on. Artwork created in any of the following Microsoft programs – Word, Excel, Powerpoint, Publisher, or Works will not produce print ready files, and this is will be the same response you will get from all commercial printers. However is can still be possible to use your file, by converting it to a PDF using a online PDF creator like this one – convert.neevia.com, just follow the instructions given online or you can download a PDF creator that you have to download to your computer like this one – www.primopdf.com the best thing is, they are both free. However, please note we cannot be held responsible for any problems that arise from using this process. Artwork (print ready): a design layout prepared for immediate print, generally a PDF file. Black: solid 100% black printing, usually for text and line drawings. Bleed: extension of the background beyond the edge of the document (3mm) to prevent unwanted white edges. Bind: the process of binding sheets together, usually plastic comb, wire or perfect bound. Bond: high quality absorbent writing paper, usually smooth and matt. CMYK: the colours printers use to create full colour, C- Cyan (light blue), M -Magenta (pink), Y – Yellow and K – Black. Collated: sorted in correct order. Design: let our talented designers give you an identity from conception-2-collection. Encapsulating: both sides film coated with heat sealed edge. Fold: the folding of documents in various formats, ie. z fold, gate fold, u fold, in half, fold in 3, etc. Fonts/Typefaces: the style of type used, ie. serif (with little ticks as times newroman) or sans-serif (no tick – arial). Full Colour: printing using cyan, magenta, yellow and black (CMYK). Gloss: high quality coated sheet, very smooth and shiny, inks sit beautifully on its surface. Greyscale: utilising a single ink to create tonal values for photos and similar. Gutters: gutters are used to separate items and allows for trimming, usually 3mmper item = 6mm gutters. Images/Pictures: a photo, logo or illustration used in design. Laminating: one or both sides film coated, but not sealed. Large Format: digital printing of any size over A3. Litho: the high quality printing process which applies ink to paper, ideal for long run and colour perfection. Margins/Safe Zone: area from the sheet edge to the start of important information. Allowance of a clear area. Matt: high quality matt-coated sheet, very smooth with a slight sheen, inks sit beautifully on its surface. 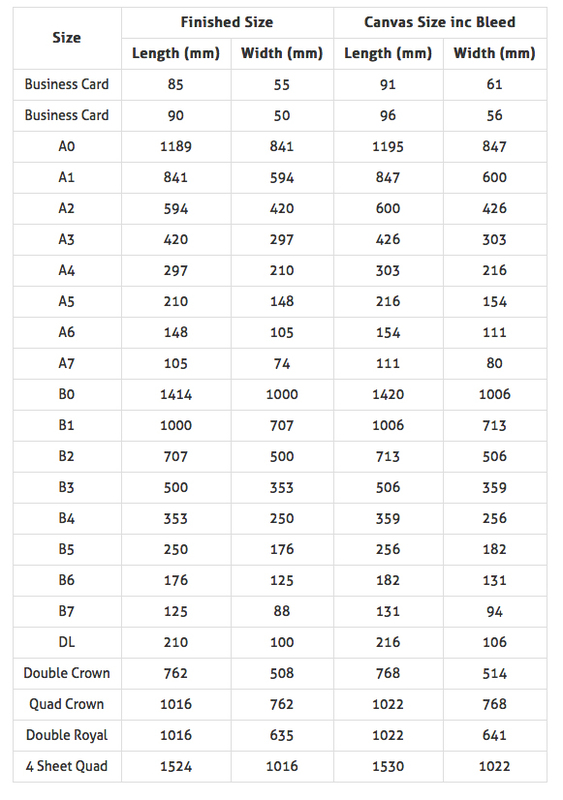 Microns: how paper thickness is measured (not weight as in gsm/grammes). NCR: ‘no carbon required’ paper – for duplicated forms and similar. Numbering: the process of adding sequential numbers to your documents. Overprinting: where a preprinted sheet has additional printed information added. Paper Weight: gsm: grams per square meter – this does not relate to the paper thickness. Perforated: a process for simple tear off sections. PP: is used to describe the number of pages or number of printed sides. Pre-Press: the process of creating litho printing plates and imposition of pages. Print Ready Artwork: files that are ready for immediate printing – using one of the above file formats. Process Colour: uses CMYK inks. Proof: is a colour representation used to check spelling,punctuation, typeface and layout. Ream: a pre-wrapped quantity of paper or card, usually 500 or 250 sheets. Resolution: dots per inch, the larger the number of dots in a square inch, the better the quality, aim for 300dpi. RGB: the colour screens are viewed in, R red, G green and B blue – colours may change when converted to CMYK. Saddle Stitch: where the document is stitched together with staples. Scanning: a digital image scanned off a hard copy document or photo, saved as a tiff, jpeg or PDF. Score: a depression in the paper or card enabling correct and neat folding. Stock/Media: the paper stock used to print your files on, varying weights, textures and colours. Vector: an illustration using lines, especially good for logos, easily scaled without loss of quality.